As far as literary figures go, Sergei Aksakov had an inauspicious beginning but flowered in middle age. Aksakov’s A Family Chronicle first appeared in 1846 in installments in a minor Moscow publication. He (1791-1859) was fifty-six years old by this time, and after a youth spent translating famous works while writing privately, he became a press-censor under Minister of Education, A.S. Shishkov. By 1839, however, Aksakov retired from government service and turned to writing. A Russian Gentleman (A Family Chronicle) was published in book form in 1856, along with A Russian Schoolboy (Recollections). Years of Childhood (The Childhood Years of the Bagrov Grandson) was published in 1858. Aksakov died the following year (1859), but his book Recollections of Gogol was published posthumously. Sergei Aksakov fathered two sons Konstantin and Ivan who were both major figures in the Slavophile movement. This merging of fact with fiction, of course, brings up many questions, but any auto-biographical work is, by its nature, just one version of events. This idea of a ‘version of events’ becomes very apparent as the book develops, but more of that later. The ‘Russian gentleman’ in the title is a thinly disguised version of the author’s grandfather–Stepan Mikhailovich Aksakov, a man, who during the reign of Catherine the Great made the bold move of selling his inherited lands “in the province of Simbirsk” and moving about 200 miles east in Ufa in the province of Orenburg. The original Aksakov family estate in Simbirsk had been owned solely by the author’s great-great-great-grandfather (don’t think I have too many ‘greats’ there). 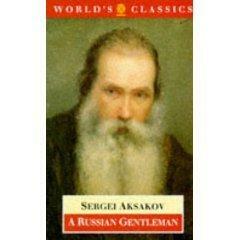 In A Russian Gentleman, the name Aksakov becomes Bagrov and we are told that over the years, and with each succesive generation, marriageable daughters had been given a “portion” which “took the shape of a certain number of serfs and a certain amount of land.” Consequently, since the land had never been surveyed, by the time Bagrov inherited, various branches of the family–living side by side–squabbled over the land, and “life under these conditions was intolerable.” And so in the story, Stepan Mikhailovich Bagrov buys 12,000 acres in Ufa and moves his family and possessions (including his serfs and his livestock) to his newly purchased land. A Russian Gentleman is the story of the move eastwards and the establishment of the new household, the son, young Alexei Stepanich Bagrov’s maturation and his subsequent courtship of Sophia Nikolaevna, their marriage, trials and tribulations, and finally the birth of their son. The significant details of the Aksakov/Bagrov divide seem to be unchanged, but since the author would not have been born at the time of events, most of the story must be heresay, exaggeration or even imagined in a fill-in-the-blank way. The first part of A Russian Gentleman (Fragment I: Stepan Mikhailovitch Bagrov) is fascinating. The author describes how his grandfather decided to buy land in the Bashkir territory, and that there were stories circulating of how “whole districts were bought for a song” under somewhat dubious and hardly legal circumstances. Bagrov travels to the region and pays 2500 roubles for 12,000 acres of land, hoping (vainly as it turns out) to avoid lawsuits by acquiring the land through legal documentation. A portion of the novel then describes the move, which is made in stages, the first constructions built and the first crops sowed on the virgin soil. It all sounds like a marvelously bold adventure so fitting for its time. Fragment II: Mikhail Maximovich Kurolesov is one of my very favourite sections of the book. This section details the marriage of the grandfather’s cousin, Praskovya Ivanovna Bagrov to the crafty, opportunistic army officer Mikhail Kurolesev. Praskovya is a substantial heiress of several properties and numerous serfs, and Kurolesev, disliked by the author’s grandfather, worms his way into the good graces of Praskovya’s female relatives, and consequently Kurolesev snares his 15-year-old bride. When the news of the marriage reaches Bagrov, he is furious and has a very low opinion of Praskovya’s new husband: “The man is a knave and rotten all through.” At first the newlyweds are forbidden to visit the Bagrov household, but over time, Bagrov forgives his cousin and her husband and allows them to visit Bagrovo. As the relationship heals and grows, Bagrov revises his opinion of Kurolesev, who is now retired from the army and gives all indications of being a sensitive and sensible landlord. Kurolesev buys property in both Simbirsk (Kurolesovo) and Ufa and another property–a “seat” in which the couple live in the village of Churasovo. As the years pass, Kurolesev travels between these properties and rumours begin to float back about the dissipated lifestyle he leads away from home. These rumours culminate in a letter which details Kurolesev’s scandalous behaviour: unrestrained “evil tendencies,” “drunken revels,” and “monstrous passions.” Praskovya, who up to this point, has very deliberately turned a blind eye to her husband’s behaviour, travels to Parashino, an estate in Ufa, and once there, her deepest fears at confirmed. But Praskovya gets more than she bargained for…. Sofya Nikolaevna, is not exactly considered much of a match. Her mother and stepmother dead and her father, a stroke victim, she’s more or less raising three brothers and two sisters alone with “only twopence to her fortune.” But according to Aksakov’s version, Sofya is throwing herself away on a very poor specimen. This sort of view continues as Sofya is raised to martyrdom and then sainthood. Interestingly, the introduction mentions that the author’s mother (and of course Sofya is just a very thinly disguised version) was “unable to reconcile herself to the bucolic existence to which she was now called…adored by her son and devouringly possessive of him.” Indeed Aksakov’s relationship with his mother does seem evident through his depiction of the lofty, saintly Sofya Nikolaevna. Of course, there’s a lot to read there between the lines, and there are passages of serfs (and family) running off to hide to escape physical punishment–although at the same time, the idea appears repeatedly that serfs are “thieves and shirkers, to a man !” Another, even uglier view of serfdom in found the behaviour of Kurolesev–a man whose blood lusts include grabbing serf women for orgies and flogging other serfs to death using the slowest most painful instruments. And of course, those who first complain to Kurolesev’s wife are the serfs who are shouted down and silenced for daring to complain about their master. Oddly enough, and rather naively so, the author writes that “forty years later,” Kurolesev’s serfs only had glowing reports of their old master. On a final note, although Pugachev’s rebellion occurred during this period, details of the rebellion are remarkably absent. Although Pugachev is viewed by the author as part of the overall troubles: “famine, plague, and the rebellion of Pugachev,” there is little else, with the family moving away until “all disturbances passed over and calmed down and were forgotten.” While Pugachev’s rebellion was a major event, especially in the region, it’s treated as an unpleasant aside, rather like bad weather that inevitably passes. Given all the trouble brought to Pushkin by the subject matter, perhaps the total lack of details was a politic decision by Akashov. My Oxford World Classics edition is translated by J.D Duff.